Although it can be tempting to go for an all singing, all dancing sewing machine when you’re looking into purchasing one, that isn’t always necessary. Sometimes, a machine that does all the basics and a little bit more is all you need. The Singer 2259 is one of these machines. You won’t find any computer screens on this little machine, but you’ll get a competent sewing machine that does everything you need it do, and gives you room to grow as you get better. 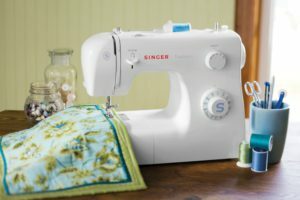 The Singer 2259 is a machine better suited to those who are just beginning to learn how to use sewing machines, and those who only intend to sew for a hobby. If you’re a professional looking for the absolute best sewing machine you can afford then your attention might be better focused on something a little more advanced. But for those looking for something simple, the Singer 2259 is something to consider. For all intents and purposes, the Singer 2259 is a basic machine. It’s very portable, weighing around 16 pounds (just over 7kg) and having its own carry handle to make moving it from place to place as simple as can be. 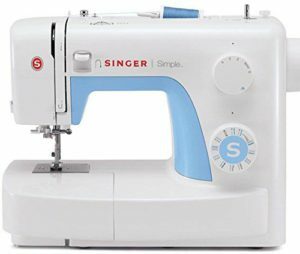 The Singer 2259 has nineteen built in stitches, with these including a four step buttonhole. Although the sewing machine isn’t self-threading, there are labels and arrows on the machine instructing you how to do this yourself, so it’s not too hard! Although the Singer 2259 won’t be winning any prizes for complex design, it is simple to use and makes the perfect beginner’s sewing machine for this reason. The machine comes with a couple of accessories that you’ll get plenty of use out of for your first few sewing projects, but you might find upgrading to better quality needles serves you well when you move on to more complicated projects and heavier materials. In a nutshell, if you’re looking for a good quality machine to get started with, and you’re on a budget, the Singer 2259 is a good choice. From a beginner’s point of view, the 19 stitches the Singer 2259 is capable of is a good number. Not too many that it confuses the user, and not so few that only the most basic sewing projects are possible. Good price! 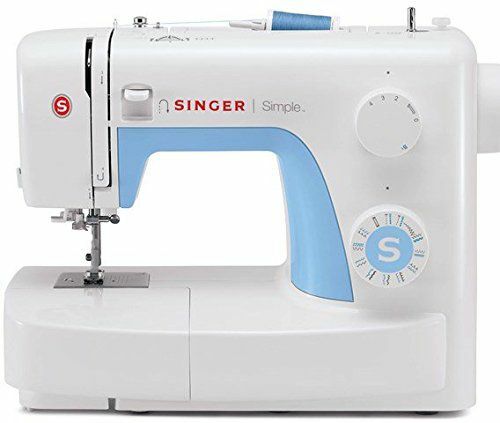 The Singer 2259 can be usually be found very cheap if you look in the right places; a bargain price for a good quality, functional sewing machine. he machine comes with a zipper foot, buttonhole foot, button sewing foot, and an all-purpose foot. Everything you need for basic projects. Easy to use – a big plus for beginners. Overall, if the type of machine you’re looking for is something you can just set up and get to work with, the Singer 2259 is a brilliant option. For an affordable price, you will have everything you need for basic to intermediate sewing projects, and the ease of use of this machine makes it perfect to learn, or teach, on.